There’s something fucked up about listening to Christmas music when the temperature outside is 80 degrees. I should be used to it. I’ve grown up in Arizona all of my life. I should be used to not having seasons or owning a heavy jacket. I should be happy that Arizona recognizes the Christmas season at all. So it might be the 80 degree weather or maybe the fact that I’m Jewish, but I can’t believe Christmas time is upon us. I’m not usually in The Holiday Spirit anyway, but this year it seems next to impossible to get into the jolly ol’ swing of things. It was easier when I was eight because teachers at school would start gearing you up for the holidays somewhere around September. Maybe the classroom would have some lights and you’d do a nice craft activity where you’d make a few ornaments. I’ve had many moments where teachers would pull me aside because of my religion. I had learnt that it is best not to make a fuss about the Jewish heritage unless it can get you out of your homework, a test, or an entire day of class. Actually, I thought it was illegal for Jews to say the name Jesus or look at a cross until I was about ten. I was fourteen before I’d utter the words to any Christmas songs, believing up until then that I would be betraying the religion for even humming Silent Night. I suppose I’ll take this time to also clarify to Mel Gibson that the Jews didn’t kill Jesus. 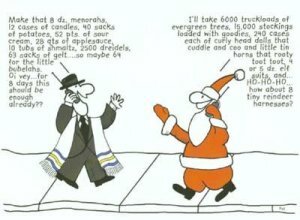 Jews are totally wimpy and neurotic. I should know, I’m one of them. Apart from Goldberg the “wrestler”, the most violent we ever get is probably just our excessive hand gesturing. We mostly fight with our wit and brisket recipes. Some of us do math for fun and all of our mothers want us to marry Jewish doctors. All of them. We’re almost all obsessive compulsive and we hate guilt, but we have tons of it. We probably did try to rough Jesus up a little though, for fun, but he probably just said -while gesturing- “Hey, you guys, I’m one of you!” and then they all had a good laugh about it and ate. It probably made a great story for years at Passover. “Hey Sheldon, remember when you tried to kill me? Oh man, that was funny! Pass the kugel?” Just like that. Stephanie likes her Christmas hot. Damn Hot. And yeah, sorry Mel, it was the Romans who did it. Then they made everything work for them, and ratified it all at the council of Nicea in A.D. 325 and..... ah forget it. It might have been the Romans, but don't you think that Pilate's hand was forced? Funny, because Turtle and I were discussing this very thing Sunday and I almost addressed the issued in my Gauntlet column this week, but I thought I'd let Jesus have his birthday before I went off on him. Yeah I sure do think so, Michele, but I'm not sure how much Pilate cared in the end. I'll hold off on elaborating until your post-Christmas Gauntlet.